Constantine Rafinesque, Ichthyologia Ohiensis, Natural History of the Fishes Inhabiting the River Ohio and Its Tributary Streams, W. G. Hunt, Lexington, Kentucky, 1820. Reprinted by Arno Press, New York, 1970. One of the species of this genus is Aractosteus spatula, known also as alligator gar. 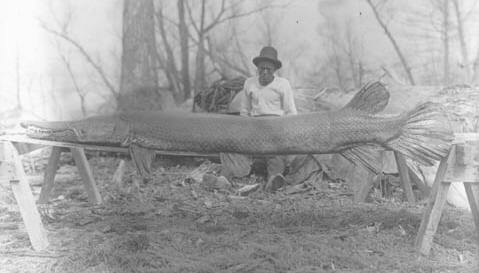 The image you see here, identified by the words "Alligator Gar. Moon Lake, Mississippi. March 1910," is used by special permission: Neg. No. 117075, Photographer D. Franklin, Courtesy Dept. of Library Services, American Museum of Natural History. This fish was about ten feet long. This is a formidable fish living in the Mississippi, principally in the lower parts, also in Lake Pontchartrain, the Mobile, Red River, &c. It has been seen sometimes in the lower parts of the Ohio. It reaches the length of eight to twelve feet, and preys upon all other fishes, even Gars and Alligators. Mr. John D. Clifford told me that he saw one of them fight with an alligator five feet long and succeed in devouring him, after cutting him in two in its powerful jaws.